I have been busy skeining the Manos del Uruguay Silk Blend Fino which arrived yesterday afternoon – it is very unusual for things to arrive on Saturday! The pattern books were not in the box – I expect they will come separately. We went to the Sword Inn Hand last night. I had sardines in parma ham – they were rather salty! John had a lemon sole which he enjoyed. I am cooking roast beef for lunch today with roast potatoes, red peppers stuffed with rice and sweetcorn, cauliflower in cheese sauce and roast onions. I have made a new desert – it is a blackberry and chocolate mousse. Basically it is dark chocolate melted with double cream and then stir an egg yolk in. Whisk the egg white separately with a tablespoon of golden caster sugar and then fold that into the chocolate mixture. Crush blackberries with some icing sugar and put them into the bottom of a sundae glass and then put the chocolate mixture on top! I will let you know if John enjoys it or not! Three more mice caught up in the loft – that makes a total of eight. I have not heard any noise since we caught the last one and so maybe that was the end of them. Going to iron now. Back tomorrow. A new contest is starting today. 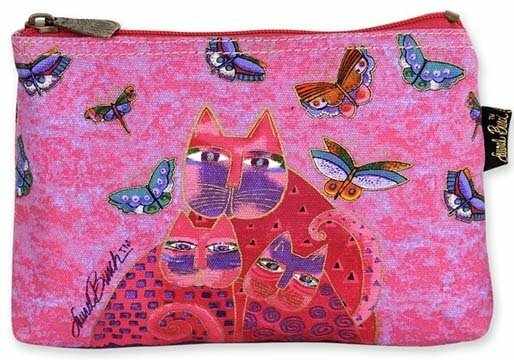 The prize is a Laurel Burch cosmetic bag. This can also be used for short needles, stitch holders, tape measure and other small knitting accessories. Harold, James, Michael, Neil, John…..who comes next? Answers to jannette@easynet.co.uk with Bag as subject by Sunday midnight please. I had heard more noises in the loft earlier this week and so we set two traps. When we looked yesterday, we had caught two wood mice. Jackson denied all responsibility! Going to make some scampi for dinner now – back tomorrow. Here is a preview of the new ROwan Studio due early October – it is called Studio Crochet. Get your hooks at the ready. We have a winner for the contest! The answers were names of rivers ( hence my flowing clue!) : Wye, Ouse, Exe and Usk. Maureen got it right and so she has won – let me know which shade you would like! I will start a new contest tomorrow. I have put the Louisa Harding Amitola yarn in my store. I am not usually a great fan of her yarns but this one is very nice. Back tomorrow. Ugh! What a frustrating day. My printer has been playing up for some while now – sometimes it will print, sometimes it won’t! I can usually get it to go by turning it off and on or removing and replacing the ink. Today, I could not make it go. I bought a new printer about a month ago and so decided it was time to bite the bullet and install it. My problem is that the CD drive on my iMac does not work and so I was not going to be able to use the installation disc with the new printer. I downloaded the appropriate drivers from HP and hoped I would be able to get it to work. After a lot of fiddling around and installing things, it is now working! Connected wirelessly to all my machines! The old one is boxed up ready to go to the dump tomorrow. The Louisa Harding books have just arrived and so I shall be sending out all pre-orders tomorrow. Also the Amitola and Orielle are here and I will put them in my shop tomorrow. As I have not received a single answer to the contest question, here is a clue……….the answer flows! 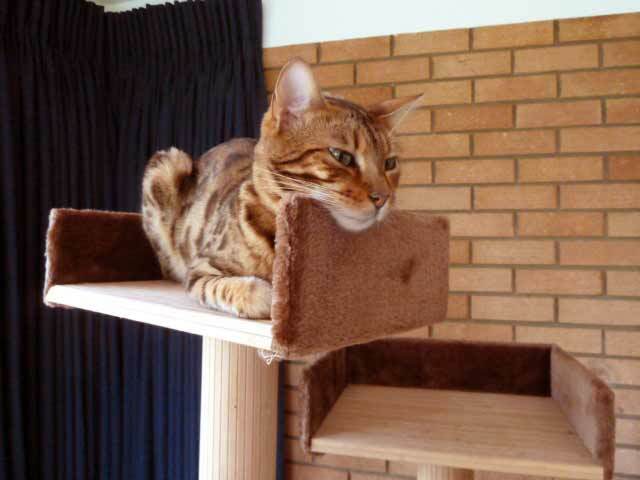 Here is Jackson looking rather grumpy – it was raining heavily and he wanted to go out but did not like the cold and so came back in and sat on the top tier of his tree contemplating the unfairness of life! The two delayed shades of Rowan Felted Tweed have just arrived – Damson and Celadon. My Laurel Burch bags arrived yesterday – I am really pleased with them. There are lots of little details on each bag – I don’t really like parting with them. News! 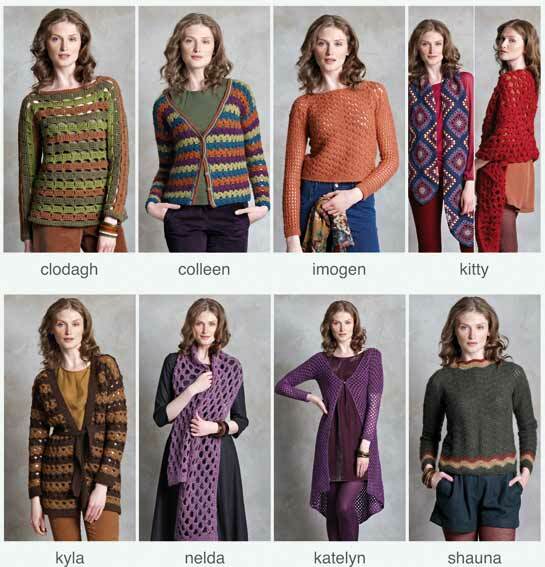 The new Louisa Harding books and yarns are on their way to me – should be here tomorrow or Thursday. Also a new 4 ply Manos del Uruguay Silk yarn. Think that is about it for now – we are going out to buy some new rugs and some paint for John’s weather vane. Back tomorrow. Raining here today. Lunch is cooking, Jackson is asleep in his hammock and Slip in her basket and I have a pile of ironing to day!